Parker collected 16 points (7-16 FG, 1-4 3Pt, 1-1 FT), eight rebounds, three assists and two steals during the Sparks' blowout playoff loss at Washington on Thursday. Even though this was a significantly better performance than her last outing, Parker still only managed just 16 points on 43.8 percent shooting from the field Thursday. The loss officially concludes the 32-year-old's season where she averaged 17.9 points, 8.2 rebounds and 4.7 assists over 31 games in the regular season. Parker had two points (1-6 FG), six rebounds, three assist and three steals in Tuesday's 75-68 home playoff victory over Minnesota. In what was her worst scoring game all year long, Parker recorded only two points while shooting just one-of-six from the floor. Luckily, other teammates stepped up and Parker will get a chance to redeem herself in the second round of the 2018 WNBA Playoffs on Thursday. Parker provided 20 points (7-16 FG, 1-3 3Pt, 5-7 FT), 10 rebounds, two steals, one assist and one block during Sunday's 89-86 road loss at Connecticut. Parker added yet another double-double in the season finale Sunday, dropping a team-leading 20 points on 43.8 percent shooting while grabbing 10 rebounds. The former WNBA MVP finished the regular season averaging 17.9 points, 8.2 rebounds and 4.7 assists across 31 appearances. 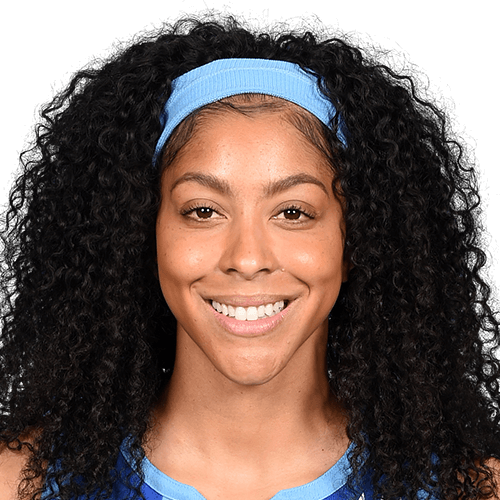 Parker registered 13 points (5-9 FG, 2-5 3Pt, 1-1 FT), eight boards, seven assists, a steal and a block across 33 minutes during Friday's 69-67 loss to the Mystics. Parker was able to flirt with a triple-double, though it wasn't enough to propel the Sparks to victory. Had she recorded the triple-double, it would have marked her first on the year. She's struggled to score the ball over the past two games, combining for 27 points despite averaging 18.0 on the season. Parker collected 23 points (8-16 FG, 3-7 3Pt, 4-7 FT), eight rebounds, two assists and one steal during Sunday's 86-78 loss at Phoenix. This was the second straight outing in which Parker has dropped at least 20 points, as she totaled 23 points Sunday while shooting 50.0 percent from the floor. Aside from her four-of-seven mark at the free-throw line in the loss, the 32-year-old is currently shooting 81.2 percent at the line this season which is her highest since 2015. Parker totaled 20 points (8-20 FG, 1-5 3Pt, 3-4 FT), 12 rebounds, four assists, three steals and one block in the 79-73 loss at Atlanta on Thursday. Despite shooing just 40.0 percent overall from the floor, Parker still managed enough to reach double figures for the 10th straight outing while also grabbing a team-leading 12 rebounds Thursday. The former WNBA MVP is currently averaging 18.0 points, 8.0 rebounds and 4.9 assists per game this year. Parker tallied 11 points (5-9 FG, 1-3 3Pt, 0-2 FT), five rebounds, two assists, one steal and one block across 18 minutes during Saturday's All-Star Game victory over Team Delle Donne. Though Parker wasn't a heavy contributor, she was able to help lead her team to victory. Through 23 appearances this season, the veteran ranks 11th in points per game (18.0), sixth in rebounds per game (7.5), sixth in assists per game (4.8) and 13th in blocks per game (1.0). Parker tallied 23 points (9-18 FG, 1-3 3Pt, 4-4 FT), 12 rebounds, seven assists and two steals during Sunday's 93-76 rout over the Sky. It was the fifth straight game in which Parker has scored more than 20 points, as she dropped 23 points on 50.0 percent shooting Sunday while also adding 12 rebounds to mark her third consecutive double-double as well. Chosen to play in her fifth All-Star game this year, the 32-year-old veteran is averaging 18.1 points per outing which is her highest since 2015. Parker will captain Team Parker at the 2018 WNBA All-Star Game. Parker and Elene Delle Donne acted as captains for their respective teams and used a draft format to select rosters. For Parker, the game will mark her fifth All-Star appearance. She's one of only three players in WNBA history to win a regular season MVP, Finals MVP and All-Star Game MVP. Parker provided 34 points (12-21 FG, 5-8 3Pt, 5-5 FT), 11 rebounds, nine assists and two blocks in the 99-78 win at Las Vegas on Sunday. Parker had a monster performance in the win Sunday, as she erupted for a season-high 34 points and finished just one rebound shy of what would have been her first triple-double of the season. Since scoring just six points on July 7, Parker has managed at least 21 points in three straight games while averaging 25.3 points per outing during the stretch. Player of the Month for August.. Awarded 2017 ESPY for Best WNBA Player. double-doubles on the year… Scored the 4,000th point of he career in the final game of the season vs.
300th steal of her career at Phoenix on 8/28… Blocked the 400th shot of her career vs. New York on 7/3. first 16 games of the regular season to rest. game three of the Western Conference Semifinals against Minnesota. against Tulsa on June 20…Set new career-highs in free throws made (12) and attempted (17) vs.
contests…Returned from injury to earn fifth career WNBA Player of the Week award on Aug.
game…Team’s leading rebounder in each of those 10 contests, and leading scorer seven times. Championships, but missed competition due t aforementioned shoulder injury. medal while representing the United States at the Summer Olympics in Beijing. minor in psychology from UT.